Hey all and happy Monday! I hope you had such a fabulous weekend and relaxed a bit! I met up with some blogger babes this weekend, some I have been friends with for years! I met Amy Ann (Straight A Style) and Rach (RD’s Obsessions) when I first started blogging. They have probably been some of my longest friendships in this business! While Rach lives in Chicago, neither of us have ever met Amy Ann in person, so it was fun to actually see her in the flesh! While I was looking for colorful spots in Michigan City, I stumbled upon this bridge. I am trying to get a bit more creative with color, and not just have walls as all my backdrops. I thought this bridge was gorgeous and the hint of blue felt perfect for this look. I wear this blazer a lot, with pretty much everything. While I was not able to find it online, it was available recently in stores, so I know it is still there! Same with these jeans… I saw them yesterday when grabbing a different pair, but sadly they aren’t online! 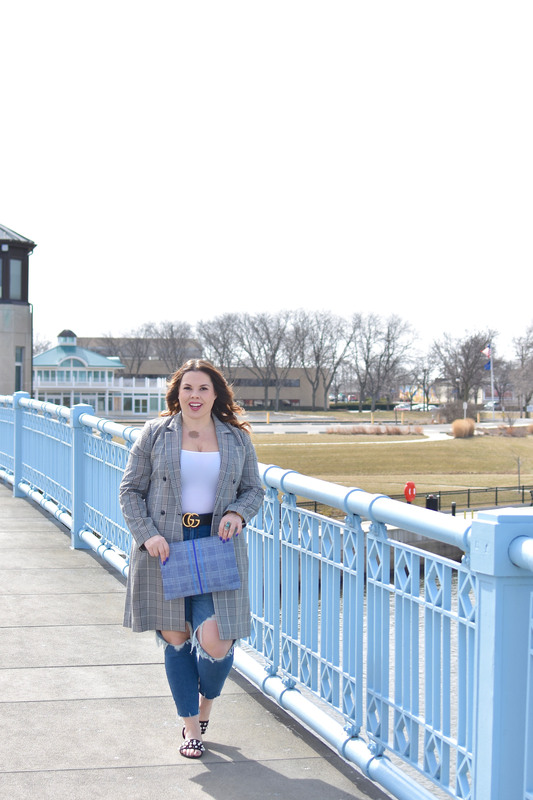 I loved the mix of the more sophisticated plaid with the super distressed denim. I added the belt, since I wear these jeans up so high. I also wanted to switch up the shoe game a bit, so these slides had to make it into the photos. I am usually a heels girl, but I also cannot pass up cute and affordable flats! Love this whole look! Those shoes are TOO cute. Love the pearl details! I’m such a big fan of blazers and this one looks so cute on you!! & love the distressed denim! that long blazer is stunning on you! Love this location too, looks like you guys have great weather over there! I love this whole look Denise! That plaid blazer is so pretty! 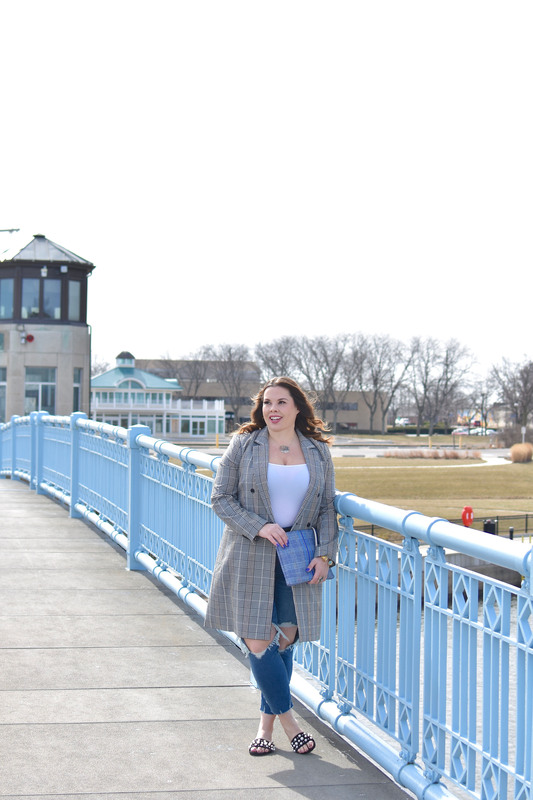 I LOVE plaid blazers and this one is right up my alley! 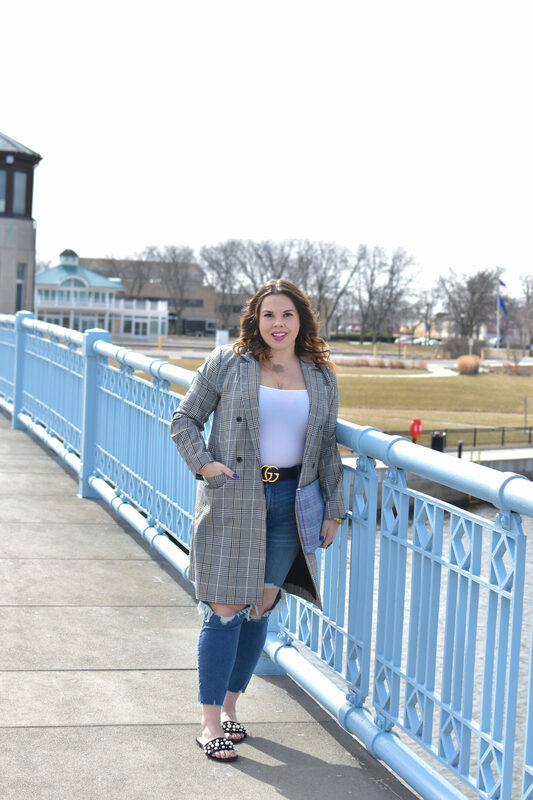 I recently got a plaid blazer and I’ve been trying to think of ways to style it and your post just gave me inspiration! What a cute blazer! I need one of those! Love how you styled it! I totally need this long blazer!! I don’t have a store near me, but I’m going to do some searching online for a similar one!! This blazer is so cute! I love the length of it! This blazer is SO adorable. Yesss, preach girl! 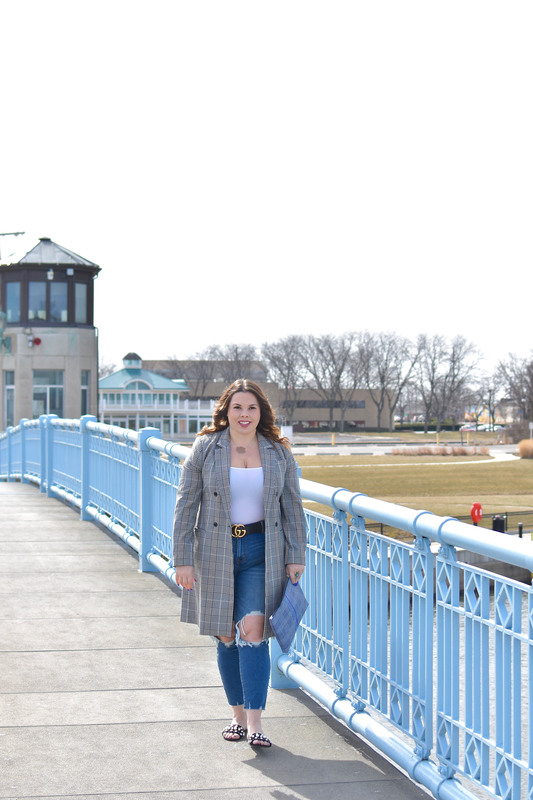 I just got a Zara, striped blazer a couple months ago, and my favorite way to style it is with jeans. It’s just the most put-together outfit anyone can put together. You look amazing girl!